First, Amanda hand alloys her own precious metals. Each metal is an alloy, bringing together a combination of metallic elements in different ratios, such as gold, silver and copper. With gold, the carat indicates the proportion of gold present in the alloy and creates a different colour. 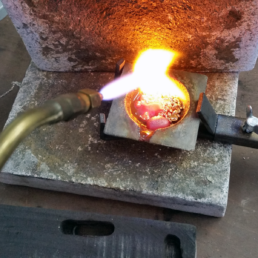 For each piece of jewellery, I carefully weigh out each of these metals, in their pure granular form, and melt them into a single ingot to work with from scratch. 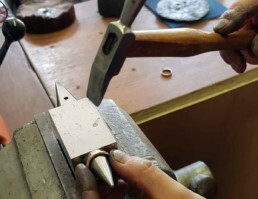 Amanda uses traditional tools to shape the metal nugget into its final form by hand, before applying the final textures and finish. Hand fabricationThis is where the real work happens. This is where the real work happens. From the alloyed ingot, I use traditional tools to mill and hand forge the metal into its final form. This process can take many hours to complete over various stages, and produces a feel and finish unique to each piece. Applied finishes & engravingI specialize in creating a variety of hand-applied surface textures, using different hammers and specialist ‘punches’ (tools). I often combine contrasting finishes: polished, satin matte, hand filed, engraved lines or patterns, to round and linear hammered textures. Different finishes can be used to highlight particular surface or metal colour. Amanda uses responsibly sourced gemstones where they are often traceable back to the mine or country of origin. 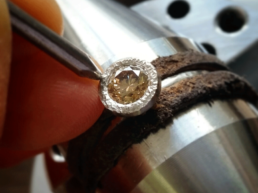 Each stone is individually hand-set into the finished piece. Quality & ethicsThe provenance and quality of my materials is incredibly important. Every piece of jewellery has its own story, and so should the materials that are used in its making. I specialise in responsibly sourced diamonds and can source the full range colours from colourless (white) to champagne through to a deep cognac. I also use a range of responsibly sourced coloured gemstones, including rubies, sapphires, emeralds and opals to less well-known stones, such as Imperial Diopside and spinel. If you are looking for something in particular, please do not hesitate to ask. Gemstone settingAll gemstones are set by hand, from the large central stones in my engagement rings, to the delicate and highly technical work needed to micropave set the tiniest of diamonds. Precision and attention to detail are incredibly important in my work. 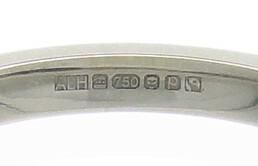 Amanda's jewellery is finally hallmarked and hand polished. 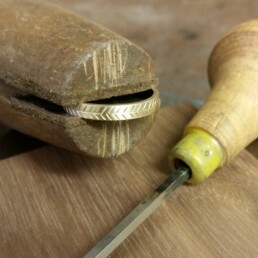 Hallmarked in LondonOn completion, each piece of jewellery is sent to the London Assay Office for hallmarking. This hallmark comprises of stamps confirming that I am the maker (with my own ALH stampe), the metal, metal fineness (%), it was tested in London, and the year it was made. If it is a Fairtrade metal, it will also have the Fairtrade mark. The final polishOnce the piece of jewellery has been returned to my studio from the Assay Office, I clean and hand polish it before placing in one of my boxes, ready to be collected and worn!